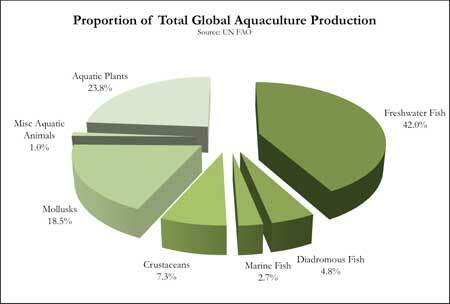 Various factors are driving the aquaculture sector to intensify. The main driving force appears to be the unavailability of sites. As availability of sites for aquaculture is becoming increasingly limited and the ability to exploit non-agricultural land is restricted, along with economic drivers, the aquaculture production systems are being increasingly intensified. ntensification may sustain profitability of farming operations, but this comes at a cost. There are management issues (water and health in particular) associated with intensification and the environmental carrying capacity and regulatory concerns that relate to increased numbers or intensity of farms. Not all farmers are able to intensify and as production costs rise part of the sector may reduce intensity to lower costs or reduce vulnerability to health or environmental problems. Under appropriate circumstances there are opportunities for organic aquaculture to play a role and this may become an economically viable form of management. The sector continuously looks for novel ways to use the environments (land and water use in particular) for production. As intensification proceeds, the need for institutional support, services and skilled persons are also in the increase; the need for more knowledge based aquaculture is clearly increasing and education and training in aquaculture has regained or regaining its importance worldwide. Aquaculture continues to explore new species options, particularly high value species, in regions and countries where aquaculture is well established. While facilities for mariculture of high value species have increased, reduction in facilities for producing low value high volume species such as carp is evident in those countries. However, in the future, reduction in freshwater aquaculture areas may partly be offset by expansion in marine areas particularly for the culture of relatively higher value species. Regions and countries where aquaculture is still in early stages; particularly Africaand some South Asian countries, freshwater species production is still continuing. In some South Asian countries better opportunities for giant freshwater prawn Macrobrachium rosenbergii are visible. The development of indigenous species production for enhancement or restocking is continuing and might be promoted in the future as a means for improving livelihoods for people that rely on fisheries as part of their livelihoods. It is also evident that the use of indigenous species has reduced the disease risks involved in and have provided more stability to aquaculture production. Seed production of indigenous species are continuing in support of stock enhancement programmes of inland waters, which are increasingly looking towards the use of indigenous species as concern and awareness over biodiversity issues increase. Countries are continuing to introduce species or strains for aquaculture, while efforts are made to develop specific strains aquaculture, particularly the high value species. Although countries are increasingly looking into complying with international norms and standards for movements of live aquatic organisms and introductions, commercially driven movements and introductions that are not responsible are also evident in many regions of the world. In the shrimp farming sector, effort has redoubled to attain the capability to locally commercialize the production of Pathogen Resistantand pathogen free broodstocks. Import Risk Analysis is increasingly becoming a standard tool for ensuring responsible movement and introduction of species and strains for aquaculture. There is a need for significant capacity building and training to mainstream its use and ensure that it is applied effectively. However, as a consequence to the increasing concerns over impacts of introductions, there will be stricter regulations on import of new species. As some traditional agricultural systems become increasingly uneconomic there has been a trend to promote or enable diversification. This may take the form of conversion from agriculture to aquaculture (e.g. 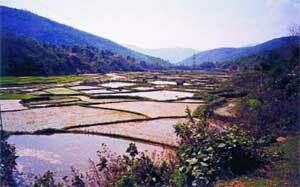 rice land for aquaculture), or the integration of aquaculture into existing farming systems. In such diversification, people enter into aquaculture to increase their earning capacity, without giving up their primary occupation as farmers. Further, secondary use of water bodies for aquaculture is also increasing in Asia and Latin America, as a diversification in the use of water bodies. This is becoming more viable in many countries as fish seed is more widely available now at affordable prices. Rice-based ecosystems often represent a dynamic and closely linked complex of rice fields, ponds, irrigation canals, and rivers (Viet Nam). A critical feature of ensuring longer-term investment in sustainable aquaculture practices and avoidance of short-term environmentally damaging practices is the existence of farmers being able to own land. Increased terms of lease are often required and specific zoning of areas (e.g. maricultureparks) can provide an enabling environment for investment in aquaculture. Subsequent spin-off effects of employment and service sector opportunities may also accompany this. There is some evidence of such trends in some countries however, this trend will continue covering more countries and regions in years to come. New systems require the development and dissemination of seed production technology (particularly the development of marine hatchery systems) and broodstock management for key species. Appropriate infrastructure and services such as land-based handling and processing facilities (landing and holding facilities, transport and cold chains) and efficient connections to markets are essential for success and countries are making improvements on these facilities and services. Polyculture or integrated culture (particularly in marine systems) offers a means for diversifying products from a system, improving efficiency of resource use and reducing the negative environmental impacts. Although this has been a traditional practice in Asian freshwaters, as well as in coastal waters, particularly in China, there is need for more research and technology transfer on marine mixed plant/animal systems where such systems are less well developed. There is a trend of increasing fish consumption in many countries and this domestic and regional demand competes with export markets, particularly in Asia. Producers and processors are slowly moving toward greater value adding and development of processed products for export markets as an avenue for increasing foreign exchange earnings and improving profitability. In such circumstances, the choice of species for farmers is becoming geared to the demand for products in the international markets. Moreover, there is a trend towards targeting urban markets with standardized, value added “easy-to-cook” or ‘supermarket-type’ products. New markets are continuing to develop and domestic demands are increasing in some countries, especially in Asia. With more stringent demands of export markets, small-scale operators are facing increasing difficulties producing products for export. There is evidence that some small operators are leaving the sector as they become uncompetitive and unprofitable. A strategy to offset this is the formation of producer associations. For some export commodities exporting countries are looking at quota systems or mutual agreements on limiting production volumes in order to avoid destabilizing market prices. There is a need to build capacity within the regions to enable countries and/or farmer groups to become capable of initiating or accessing market information and research, in particular for the species targeting non-domestic markets. Processing and product diversification are developing in response to better market information. There is a greater concern on the wholesomeness of aquaculture products and on making aquaculture operations environmentally safe. The international and national demand for safe and higher quality aquatic products is increasing and there is a clear need to improve product quality and safety. There are improvements in cold chains and control systems for ensuring product quality and safety and more emphasis will undoubtedly be put in place for these aspects in coming years. There is a clear trend towards development and implementation of safety and quality standards. In the last decade greater emphasis was placed on better aquatic animal health management and food safety following public concerns and reports of contaminants in fish products in all regions of the world. Initiatives have been taken by the European Union to ensure that the benefits are translated in a harmonized manner across the Western European region and beyond. The use of antibiotics has declined significantly in the last decade in Europe and Latin America following the widespread use of vaccines in the salmon and bass and bream industry. Similarly, the stringent export regulations such as minimal residue levels for banned antibiotics and veterinary drugs have reduced the reliance of antibiotics in shrimp aquaculture in Asia and Latin America. There is a growing trend towards 'eco-labelling' of aquatic products. FAO’s guidelines for eco-labelling of capture fishery products are now in place, although the same for aquaculture products are yet to be developed. Eco-labelling is often considered as no more than a marketing tool. However, with the increasing concern on the environmental issues among the consumers worldwide, products that are grown in a responsible manner without harm to the environment are gaining competitive edge particularly in the developed countries. Aquaculture is maturing as a responsible sector and emphasis on better enforcement of existing legislation is becoming apparent. As enforcement of law is a continuing constraint in many countries, strong emphasis is being placed on increasing self-regulation by farmer associations and the sector in general. There is a general trend towards improving governance in aquaculture development and management. As aquaculture often co-exists with agriculture in inland areas and with coastal and wetland natural resources elsewhere, there is a trend towards more integrated land use planning and registration of farms for aquaculture. This requires the establishment of farmer friendly land ownership and appropriate environmental planning (e.g. land use surveys and development of specific zoning (aquaculture zones), which is slowly gaining recognition. It is clear that in some countries there is need to develop specific aquaculture legislation to better regulate the sector. The increasing requirement for traceability and certification is now leading towards adoption of mandatory registration of aquaculture facilities as part of national legislation. Many countries are developing and implementing regulation on the use of antimicrobials, veterinary drugs and chemicals in aquaculture. Monitoring and surveillance programmes are also being established in some countries as a measure to reduce production losses from emerging diseases. As an essential part of self-regulation of the sector, there will be further development of codes of practice and better management practices (BMPs) in collaboration with farmers. This also requires appropriate mechanisms for dissemination and communication of codes of practice though farmer organizations. Aquaculture does not exist in isolation and increased regulation of the sector also requires that its external effects are moderated. Against a trend of increasing intensification and increasing numbers of farms in some areas, there is a requirement for Environmental impact assessment and routine environmental monitoring. Increasingly there will be requirements foraquaculture to ‘pay the real cost’; for the environmental services that it utilizes. Mechanisms such as ‘polluter pays’ and ‘resource rents’ (user pays) will be put in place. This requires improved capacity for monitoring and concurrent development of laboratory infrastructure and capacity building within the competent agency/organization. Effective regulation is only possible with an effective information system. 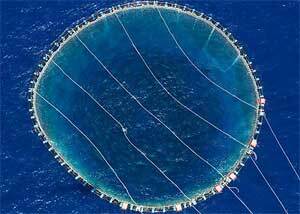 This requires improved quality of aquaculture information and statistics. The types of information collected should be targeted at specific needs for management of the sector and there will be a concurrent need for information management systems that enable use of the information for local management and not overcentralized. In many countries, instead of high yield per unit area, aquaculture is now aiming more on economic sustainability and overall competitiveness. One of the key areas considered is the improved management of health. As pathogens and diseases are causing significant losses in global aquaculture, the sector is now giving strong emphasis to reducing the losses due to diseases. This trend does not only focus on production and practice, but also the issue of acquiring quality inputs like clean seed and quality feed, and sound advice to reduce risks of production failures. The combined effect of all these trends is to drive the sector towards improved or better management. This is seen at the individual farm level as well as specific sub-sectoral levels. It has not occurred simultaneously throughout the aquaculture sector worldwide; although in the future it will materialize as different pressures are applied (these could be regulatory, market, environmental or social, etc. ).